A variation of grilled pork. Sizzling Wild Boar makes use of wild boar meat in place of regular pork. Considered a wildgame meat, wild boar meat is clean and healthy (although more expensive) because wild boar eats only vegetables. The recipe can be substituted with domestic pig’s meat instead of wild boar if non is available. 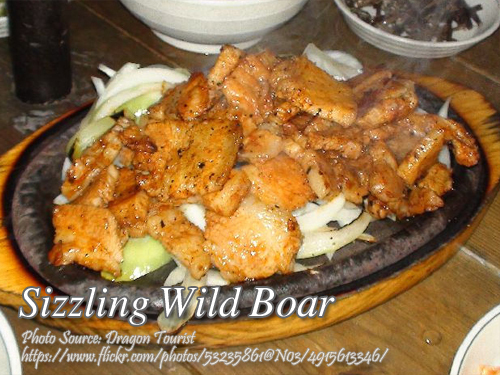 To cook sizzling wild boar; In a glass or plastic bowl, mix together garlic, vinegar, soy sauce and brown sugar. Do not use a metal bowl. Marinate pork. In the mixture for at least 2 hours, preferably overnight, in the refrigerator. Grill pork over charcoal fire, basting with the marinade as it cooks. If you want to make it spicy, add dashes of Tabasco sauce in the marinade and mix well before using it for basting. Transfer to a hot sizzling plate. Pour some of the marinade over the pork. Top with toasted garlic. In a glass or plastic bowl, mix together garlic, vinegar, soy sauce and brown sugar. Do not use a metal bowl. Marinate pork. In the mixture for at least 2 hours, preferably overnight, in the refrigerator. Grill pork over charcoal fire, basting with the marinade as it cooks. If you want to make it spicy, add dashes of Tabasco sauce in the marinade and mix well before using it for basting. Transfer to a hot sizzling plate. Pour some of the marinade over the pork. Top with toasted garlic.